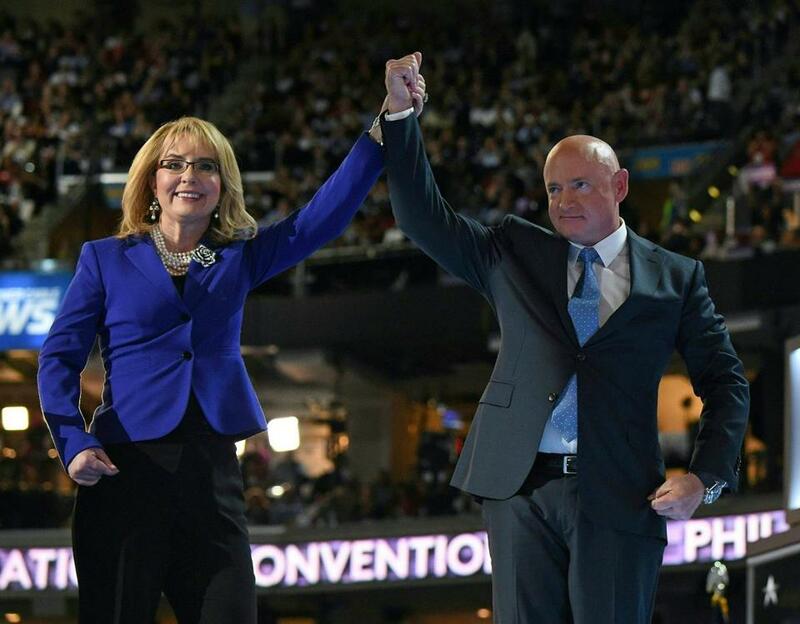 Former Arizona representative Gabby Giffords and her husband, astronaut Mark Kelly, addressed the 2016 Democratic National Convention. Mark Kelly, the former astronaut and gun-control activist who is married to Gabrielle Giffords, announced Tuesday that he would run for Senate in Arizona, challenging appointed Senator Martha McSally and intensifying the Democratic threat to Republicans’ narrow control of the chamber. Kelly’s entry sets up a possible general election between two combat veterans in a swiftly changing state and may elevate Arizona further as a 2020 battleground. Both parties already view Arizona as a swing state in the presidential race and in 2018 Democrats won a Senate race there for the first time in decades. McSally, an Air Force veteran, was narrowly defeated in a statewide race last year by Senator Kyrsten Sinema. McSally joined the Senate anyway a few months later, appointed to fill the vacancy left by John McCain’s death after a placeholder appointee, Jon Kyl, resigned. Kelly, 54, unveiled his campaign in an online video highlighting his experience as an astronaut and Navy pilot. Giffords, a former member of Congress who was shot and nearly killed by a deranged gunman in 2011, appeared beside him in the message. Giffords was seen as a likely future Senate candidate before the shooting and the video casts Kelly as carrying forward her legacy. For several years, the two have led a national gun-control group that played a significant role in the midterm elections. Narrating the video, Kelly presented himself as a nonpolitician and a unifying figure, focused on issues like health care, wage stagnation, and climate change. That approach echoes the avowedly moderate course Sinema charted in her campaign last year, when she successfully assembled a coalition of young people, Latinos, and centrist whites opposed to President Trump. Kelly lamented a “retreat from science and data and facts” that he said prevents problems from getting solved. He did not mention Trump or attack the Republican Party. Kelly may not have an open path to the Democratic nomination. At least one other prominent Democrat, Representative Ruben Gallego, has been exploring the race. He could present a challenge to Kelly on the left. Gallego said Tuesday morning that he was still considering the race, indicating he would not make way for Kelly. McSally is also likely to face pressure from her party’s activist flank. In 2018, she shifted well to the right to navigate a Republican primary, aligning herself closely with Trump in a way that ultimately harmed her in the general election. The two parties are also aggressively targeting Republican-held Senate seats in Georgia, Iowa, Maine, Colorado, and North Carolina, and a Democratic-held seat in Alabama, among others. Kelly has been among the most closely watched potential Democratic candidates, along with Stacey Abrams in Georgia.